Summer is the perfect time to disconnect from devices and reconnect with the outdoors. Now in its 35th year, Wayne Art Center’s 2019 Summer Arts Camp offers a wide range of classes to do just that! This year’s theme, Nature and Art: Connecting with Our World, invites artists ages 3 to 16 to explore the world around them for creative inspiration. Each week, campers investigate new habitats and the art they have inspired to create their own unique pieces that reflect their discoveries. With nearly 200 classes to choose from, parents can tailor the camp experience for their child. Grouped by age, campers are presented with a variety of media as they build skills in drawing and painting, ceramics, collage, sculpture, jewelry making, fashion design, photography and more! Nestled in Wayne along the Radnor Trail and home to seven of its own gardens, Wayne Art Center offers an ideal location for outdoor exploration, while light-filled, air-conditioned classrooms provide safe and comfortable surroundings for campers. There is no limit to the exciting opportunities students can expect. Campers enrolled in Welcome to the Jungle week might learn about rainforests and study works by Henri Rousseau before sculpting an elephant from clay or painting a trio of tropical birds. During Magnificent Mountains, jewelry students might study precious gems and stones before creating their own wearable art, while younger students explore Paul Cézanne’s work before constructing their own volcanoes. On Friday each week, campers are encouraged to invite friends and family to an exhibition at Wayne Art Center, where the artists share their work from the week and celebrate their accomplishments. 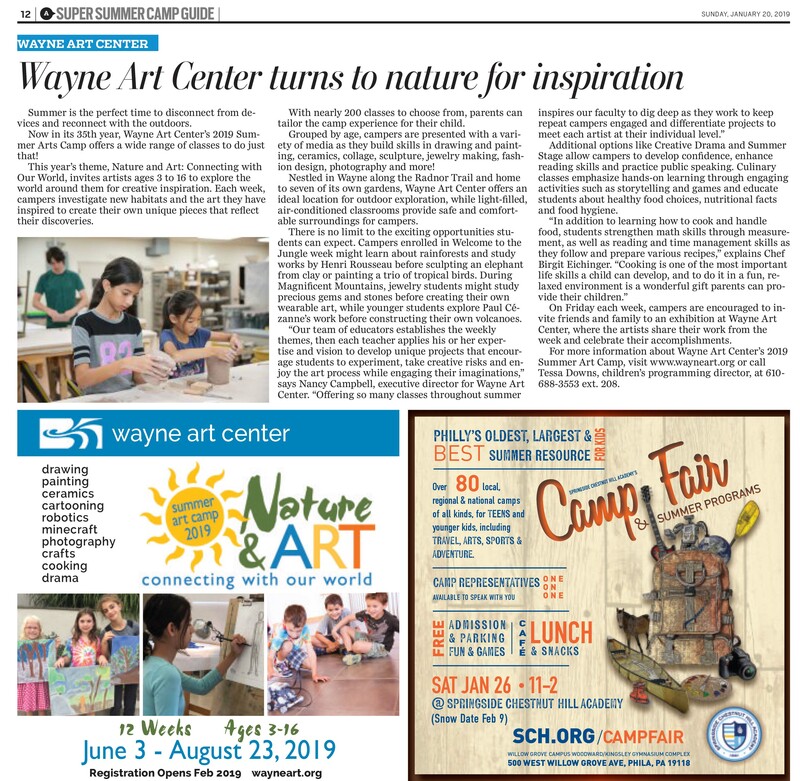 For more information about Wayne Art Center’s 2019 Summer Art Camp, visit www.wayneart.org or call Tessa Downs, children’s programming director, at 610-688-3553 ext. 208.